The 2019 Society of General Physiologists (SGP) Annual Symposium, to be held at Valparaiso, Chile on September 4th-7th, 2019. The topic will be “Structural Basis of Electrical Signaling in the Heart and the Nervous System”. 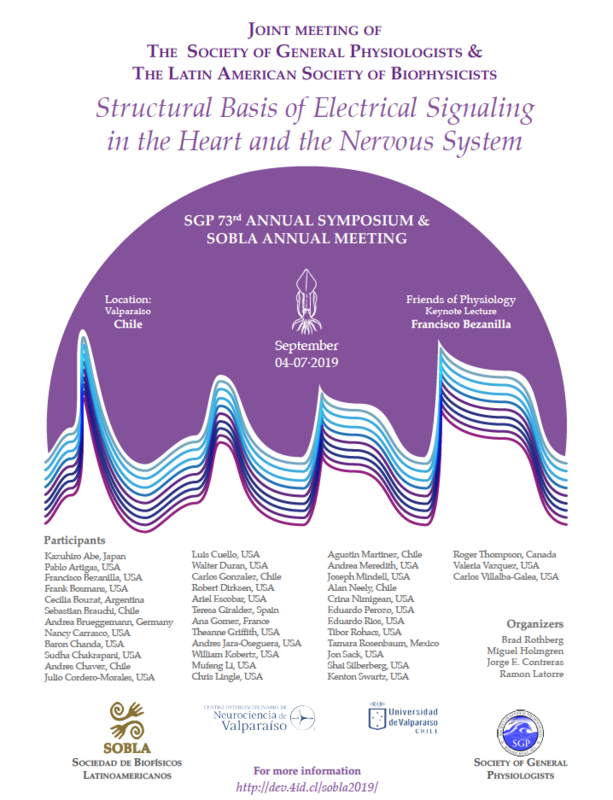 The SGP/SOBLA 2019 symposium will bring together experts in different key areas (from structure to physiology), who by combining multidisciplinary approaches have elucidated molecular, cellular, and integrative physiology of channels/transporters in a variety of animal models that are relevant to physiology and disease. New advances communicated at the meeting are expected to inform novel methods for the diagnosis and treatment of human health and disease. The symposium will serve as an important platform to foster new scientific collaboration between scientists from the USA and Latin America. Scientists and trainees from both US and Latin America will have the opportunity to exchange professional and cultural experiences that help us to create a better and trusted global scientific community. "Revisiting the Central Dogma of Molecular Biology at the Single-Molecule Level" – Lima 2019. Biophysical Society Thematic meeting, which will be held July 18-21, 2019, in Lima, Peru. For more information click here. Biophysicist in Profile: Sebastián Brauchi (See profile). In the Bulletin of the Biophysical Society, April 2018. The SOBLA has officially endorsed the scientific journal Physical Biology. We are happy to announce that Physical Biology has become the official journal of the SOBLA. Thus, SOBLA members will now enjoy complimentary online access to Physical Biology.